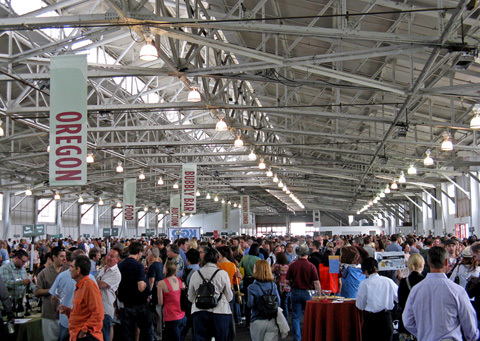 Report on the 7th annual Pinot Days San Francisco Grand Festival Tasting, on Saturday June 18th, 2011, at Fort Mason in San Francisco. 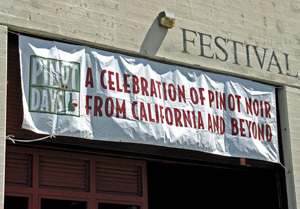 The event focuses on current releases of Pinot Noir from producers in California and around the world. 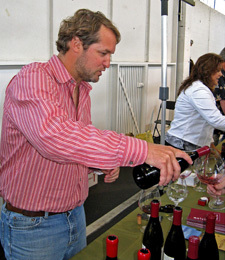 Pinot Days includes lots of events leading up the Grand Festival Tasting. In the week or so before that Saturday, there were tastings at a number of Bay Area wine shops and wine bars, a winemaker dinner at Scala’s Bistro in San Francisco (presented in conjunction with the American Institute of Wine and Food), and three focused tastings (highlighting Oregon Pinots, Pinot’s Diversity of Style, and Williams Selyem Winery) at Fort Mason. There was also Pinot Days’ first ever online auction – with lots featuring fine wines, wine tastings, tours, and other Pinot-related items. 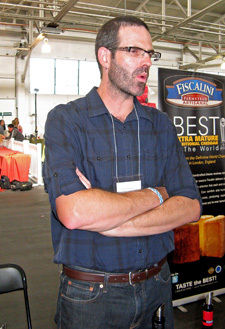 There was another separate auction at the Grand Festival Tasting itself. The proceeds of the auctions benefit the OCMC Water Well Dig Project for the Turkana people of Loupwala in East Africa. 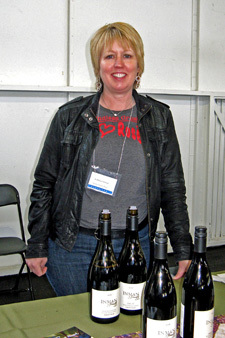 Over 200 producers were represented at this year’s Pinot Days event. Most were from California – from nearly every Pinot region in the state – and there were also 18 Oregon wineries and small contingents from Burgundy and New Zealand. Most poured recent releases or wines that will be released within the next year, though there were a few barrel samples and older wines as well. And there were also a few non-Pinot wines on hand, which actually proved a nice change of pace once in awhile. This was the first year that I’ve had a chance to do nothing but taste at Pinot Days. In previous years, I’ve always been on the other side of the table, pouring for Eno Wines and once or twice for other wineries. Since I hadn't gotten a lot of time to get out from behind the table and taste at Pinot Days before, I've never had a good sense for how large the crowds were so I don't really know how attendance was compared to past years. The large Festival Pavilion was not packed, but I don't know if that's typical for Pinot Days. Even so, there were some tables that were too crowded for me to get near. I was able to get back to some of them, but there were a few that I never did get back to, Sojourn and Papapietro Perry among them. The first part of the event check-in was smooth – volunteers were on hand to scan tickets and distribute wristbands to attendees before they lined up outside the door. The badge pick-up for trade & media attendees…not so smooth. I bumped into Eric White not long afterwards, and he already knew that particular issue would need to be addressed for next time. But that was a very minor glitch, and the event ran very smoothly. There were plenty of stations with bread and cheese around the space (and they were frequently restocked), bottled water was available, dump buckets were regularly emptied – all those little things that can detract from the overall experience at large tastings if they’re not handled properly were done very well at Pinot Days. I already knew this from the times I’ve poured at the event, but Pinot Days continues to be one of the best-organized large wine tastings each year. The table layout was easy to navigate, both in terms of having plenty of space to circulate and also clear table identification signage that made it easy to find producers I was looking for. Most wineries were arranged in alphabetical order, with the exception of wineries from Oregon and Burgundy – and a table with assorted New Zealand Pinots – which were grouped separately to make it easy to focus on those producers if one wished to do so. Grape-Nutz colleague Al Osterheld and I split up for this tasting – although we didn’t coordinate our tasting strategies (if we had any at all! ), we figured we would each visit a lot of different wineries as well as some of the same ones. We both passed up some very good producers whose wines we’d both tasted fairly recently, including Benovia, Dutton-Goldfield, and a couple of others. All in all, splitting up our tastings proved to work out well, and we covered many more wineries that way than if we’d stuck together. Still, with so many fine wineries pouring at this event – both old favorites as well as newer producers I wanted to check out – it was inevitable that there would be some that I’d hoped we’d get to but that neither of us managed to visit. Archery Summit, Belle Glos, Cartograph, Sojourn, Siduri, and Papapietro Perry were among the ones we missed out on this year.And a few tables were already cleared out by the time I got to them, notably Kosta Browne, Tantara, Domaine Serene, and Roar – I’ll have to be quicker in getting to them in the future! But you can never get to all the producers you’d like to at such a large tasting event anyway, and overall I think that Al and I managed to cover a good cross-section of the wineries. As you would expect, California Pinots were particularly well-represented at Pinot Days – though certainly not all the top producers poured there, a fair number of them did. Many of the current releases were from the 2009 vintage, and this looks to be a promising one, similar in some respects to 2007 though perhaps with a bit less lushness and ripeness to the fruit. Current wines from the 2007 and 2008 vintages were poured as well – the 2008 vintage was a difficult one in many parts of the state, but there were still some outstanding wines from that year. The Oregon contingent, although limited in number and missing many of the big names, still showed fairly well, particularly with their 2008 wines. In contrast, the New Zealand and Burgundy wines had a rather meager showing – just a tiny smattering of producers, and many of them not among the better ones. Hopefully, we’ll see more from these areas at Pinot Days in the future. Looking through the wines listed as favorites, I notice that most them hail from Anderson Valley, Russian River Valley, and the Sonoma Coast – a particularly good showing for these growing regions. A few that nearly made the favorites list included wines from Alma Rosa, Cargasacchi, Clos Pepe, Freeman, Le Cadeau, Loring, and Skewis, among others. The favorites listed here are from current releases and wines to be released soon, though I should also note that the one barrel sample I tasted – the ‘09 Kendric Marin County – was very promising, and the ’06 Clos Pepe Estate was a standout among the older vintage wines poured at the event. I limited the wines on the list to no more than one per producer, though several of the wineries that were our overall favorites at this year’s tasting – Auteur, Breggo, Clos Pepe, Copain, Failla, Scherrer, Small Vines, and Sokol Blosser – could have had more than one listed. Being able to taste so many fine Pinots in one afternoon is a real treat, and the experience did indeed showcase the diversity of Pinot Noir. Lighter-bodied or big and bold, fruit-forward or earthy, there were good examples in styles to suit nearly everyone’s tastes. Though this is only its seventh year, Pinot Days has already taken its place among the top Pinot-themed events in the US. I may well be back behind a winery table pouring again next year, but it was fun to be in front of the tables and tasting this time! Alma Rosa 2008 Pinot Noir, Sta. Rita Hills. Medium-light color, with very pretty floral aromas along with black cherry, smoke, and spice. Medium-bodied and lively, with a finish that was clean but slightly rough. Alma Rosa 2008 Pinot Noir, La Encantada Vineyard, Sta. Rita Hills. Medium ruby color, with more intense black cherry and plum fruit, smoke, and minerals. More structured in the mouth, with some tannic grip on the finish. Ampelos 2006 Pinot Noir, “Rho,” Ampelos Vineyard, Sta. Rita Hills. Medium color, minerally red fruits, earth, and a touch of spicy oak. Medium-bodied and fairly smooth, with refined tannins. Ampelos 2007 Pinot Noir, “Lambda,” Ampelos Vineyard, Sta. Rita Hills. Medium-light color, showing plum and darker berry fruit, hints of dried herbs, and a more noticeable oak component. Bigger and more structured than the “Rho” bottling, with a lively finish. Ampelos 2008 Pinot Noir, Fiddlestix Vineyard, Sta. Rita Hills. Medium ruby color, with aromas of dark berries, earth, spices, and sweet oak. Richer mouthfeel with great acidity and a moderately grippy finish. Arcadian 2007 Pinot Noir, Pisoni Vineyard, Santa Lucia Highlands. Medium color, featuring earth, spice, and plum aromas. Very nice depth of flavors and texture on the palate, finishing with some moderate tannins, nice. Arcadian 2005 Pinot Noir, Pisoni Vineyard, Santa Lucia Highlands. A bit lighter color than the ’07, with some floral notes along with both red and black fruits, and a slight stemmy note. The tannins are a bit mellower than the ’07 but this still has plenty of structure. Arcadian 2007 Pinot Noir, Fiddlestix Vineyard, Sta. Rita Hills. Medium-light color, with earthy cherry fruit plus an herbal, tea leaf component. Lively mouthfeel, with a moderate tannins. Arcadian 2005 Pinot Noir, Fiddlestix Vineyard, Sta. Rita Hills. A little darker than the ’07, showing an earthier profile and darker fruit aromas. Bigger on the palate, this had a more grippy finish than the ’07. Comments: A good opportunity to taste two vintages of these two wines, really highlighting both the vineyard and vintage distinctions. Argot 2009 Pinot Noir, “Over The Moon,” Silver Pines Vineyard, Bennett Valley. 60% Mariafeld clone, 40% Pommard. Medium color, showing spicy cherry and rhubarb aromas, medium-bodied with good acidity and lively finish. Argot 2009 Pinot Noir, “The Fence,” Sonoma Coast. 90% Pommard clone, 10% Mariafeld. Medium-dark color, black cherry and raspberry fruit, lots of spice, and vanilla/oak on the nose. More full-bodied and rich on the palate, and a more tannic finish. A bigger-styled Pinot that will need some cellar time to come together. August West 2006 Pinot Noir, Graham Family Vineyard, Russian River Valley. Light garnet color, displaying strawberry and bing cherry, cinnamon, and a touch of earth. Medium-bodied with a smooth finish. August West 2006 Pinot Noir, Rosella’s Vineyard, Santa Lucia Highlands. Medium-light color, with more fruit-forward black cherry and spice aromas. More structured than the ’06 Graham, this had some moderate tannins and lots of spice on the finish. August West 2008 Pinot Noir, Graham Family Vineyard, Russian River Valley. Medium-light garnet color, showing cherry, spice, cola, and a touch of earth on the nose, with a more depth than the ’06. Lively mouthfeel with a long, tasty finish, nice. August West 2008 Pinot Noir, Rosella’s Vineyard, Santa Lucia Highlands. A bit darker color than the Graham bottling, the aromatics were a bit muted, but showed slightly tart black cherry and raspberry along with an herbal note. Good acidity with a juicy finish. August West 2009 Pinot Noir, Graham Family Vineyard, Russian River Valley. Medium-light purple, with raspberry and plum fruit and spice. Bigger texture on the palate, with tannins that sneaked up on the finish. This could use some additional time in bottle to show its best. August West 2009 Pinot Noir, Rosella’s Vineyard, Santa Lucia Highlands. Medium-light color, a bit tight at first but opened to reveal bright ripe black cherry, a touch of citrus, and baking spices on the nose. A vibrant texture in the mouth, with good structure for some time in the cellar. Auteur 2009 Pinot Noir, Sonoma Stage Vineyard, Sonoma Coast. Medium ruby color, very pure fruit aromas of ripe raspberry and plum, along with spice and earth notes. Medium-full bodied and smooth mouthfeel, with a tasty finish. Auteur 2009 Pinot Noir, Manchester Ridge Vineyard, Mendocino Ridge. Medium color, showing brighter black cherry and raspberry fruit, herb, forest floor, and spice aromas. Very lively acidity and long finish, with refined tannins. Quite distinctive Pinot that should age well, very nice. Auteur 2009 Pinot Noir, Shea Vineyard, Willamette Valley. Medium-dark color, featuring darker berry fruit along with bigger earth and forest floor components and more noticeable oak. Bigger on the palate with chalky tannins on the finish. Comments: Auteur presented one of the tasting’s best group of wines. I’ve particularly enjoyed Pinots sourced from Manchester Ridge Vineyard in the past, and the ’09 Auteur bottling is another fine one. Breggo 2010 Pinot Gris, Anderson Valley. Made in about 60% stainless steel, 40% neutral oak. Light straw color, aromas of ripe stone fruit, lees, and a bit of spice. Nice texture, with a hint of sweetness on the refreshing finish. Breggo 2009 Pinot Noir, Anderson Valley. Medium-light color, showing earthy and upfront cherry fruit with an herbal note. Medium-light bodied, with a mildly tannic finish. Breggo 2009 Pinot Noir, Donnelly Creek Vineyard, Anderson Valley. To be released this fall. Medium-light color, with complex aromas of black cherry, tea leaf, forest floor, a savory component, and a touch of oak. Medium weight on the palate with good structure and moderate grip on the long finish, nice. Comments: Breggo continues to be one of the standout Anderson Valley producers, and winemaker Ryan Hodgins poured a very good group of wines. Point Concepción 2009 Pinot Noir, “Salsipuedes,” Santa Barbara County. Sourced mostly from Jalama Vineyard. Medium ruby color, with black cherry and plum fruit along with tea leaf and spice notes. Medium-bodied and smooth on the palate, with mild tannins on the finish. Cargasacchi 2008 Pinot Noir, Cargasacchi Vineyard, Sta. Rita Hills. 100% Clone 115. Medium color, aromas of raspberry and plum, with a savory component along with earth and smoky oak. A bit bigger and more structured than the “Salsipuedes” bottling, with a moderately grippy but tasty finish, nice. 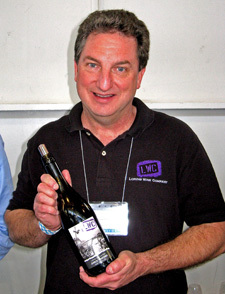 Comments: The Chronicle wines are made by Ted Lemon, the well-known owner and winemaker of Littorai. Comments: Winemaker Wes Hagen always brings a number of vintages to highlight the current releases, as well as to taste the way the wines develop, and the older releases showed impressively. As noted, the ‘09s need some cellar time, but based on the track record of the Clos Pepe Pinots, they should be outstanding in a few years. Copain 2009 Pinot Noir, “Tous Ensembles,” Anderson Valley. Sourced from five vineyards. Medium-light color, displaying bright upfront cherry fruit, along with notes of earth and forest floor. Medium-light bodied, smooth yet lively. Copain 2009 Pinot Noir, “Les Voisins,” Anderson Valley. Medium color, aromas of red fruits, dried herbs, minerals, and baking spices. Bright acidity in the mouth, where the mineral component is emphasized, and moderate but refined tannins on the finish, very nice. Copain 2009 Pinot Noir, Wentzel Vineyard, Anderson Valley. Medium ruby color, with a similar profile to the “Les Voisins” bottling but more intense fruit and a bit less of the herb and mineral elements. A bit richer on the palate, with fine acidity and balance. Comments: Very impressive showing for the Copain Pinots, one of the strongest line-ups of the day. Both the “Les Voisins” and the Wentzel Vineyard bottlings were highlights and it was a toss-up as to which of the two was included in the “favorites” list. Straight Line 2009 Pinot Noir, Mendocino County. Medium color, with black cherry, forest floor, spice, and herbal/stemmy note. Fairly smooth mouthfeel with mild but noticeable tannins. Couloir 2009 Pinot Noir, Monument Tree Vineyard, Anderson Valley. Medium ruby color, less fruit-forward than the Straight Line bottling, showing more forest floor and earth together with raspberry, plum, and spice – more complex yet better-integrated than the Straight Line. Bigger and more structured, with grippier tannins, nice. Comments: Couloir also makes a very good Marin County Pinot, which I tasted at another recent event. De Tierra 2007 Pinot Noir, Silacci Vineyard, Monterey County. Medium color, showing some green/herbal notes along with cherry and earth aromas. Medium-light bodied, with very bright acidity and a grippy finish. De Tierra 2006 Pinot Noir, Tondré Grapefield, Santa Lucia Highlands. Medium garnet/red color, with bigger earth and mushroom aromas along with black cherry fruit. A bit bigger mouthfeel than the Silacci bottling, with moderate tannins. De Tierra 2007 Pinot Noir, Monterey County. Sourced from Silacci and De Tierra Estate vineyards. Medium ruby color, more fruit-forward raspberry and wild berry with earth and spice. Rounder mouthfeel with a longer finish than the first two wines. Derby 2008 Pinot Gris, Derbyshire Vineyard, San Simeon, San Luis Obispo County. Aged in stainless steel and neutral oak. Very light color, with aromas of pear, citrus, earth, and spice. Very vibrant, zippy acidity, with a crisp finish. Derby 2008 Pinot Noir, Derbyshire Vineyard, San Simeon, San Luis Obispo County. From 115, 667, and 777 clones. Medium color, with herbal cranberry and cherry fruit, plus touches of earth, baking spices, and oak. Medium-bodied with a bright mouthfeel and clean finish. Derby 2007 Pinot Noir, “Reserve,” Derbyshire Vineyard, San Simeon, San Luis Obispo County. From 115, 667, and 777 clones. Medium ruby color, featuring more intense plum and tart cherry and dried herb notes, along with a more noticeable vanilla/oak component. Richer and smoother on the palate with a lively finish. Comments: Derbyshire vineyard is located a virtual stone’s throw from the ocean near San Simeon, and the wines were distinctive. Comments: This is one of the Boisset Family Estates lines of wine. Donum 2007 Pinot Noir, Estate, Russian River Valley. Medium color, with ripe cherry, cola, spice, and oak aromas. Medium-bodied with a fairly smooth texture and milder tannins on the finish. Donum 2007 Pinot Noir, Estate, Carneros. Medium garnet color, showing more earthy and herbal red fruits on the nose, along with a dash of sweet oak. More structured than the RRV bottling, with a grippier finish. Dunstan 2010 Rosé, Durell Vineyard, Sonoma Coast. Made from saignée of Pinot Noir. Light salmon color, with fresh strawberry aromas along with a savory note. Lively mouthfeel and a clean finish. Dunstan 2008 Pinot Noir, Durell Vineyard, Sonoma Coast. Medium ruby color, with black cherry and plum fruit, spice, and a big vanilla/oak element. Medium-bodied and smooth. Comments: A very good group of wines poured at the Failla table. Hirsch 2009 Chardonnay, Sonoma Coast. Very light straw color, this showed bright citrus and spice along with a touch of vanilla. Medium weight on the palate with good acidity on the finish. Hirsch 2009 Pinot Noir, “The Bohan Dillon,” Sonoma Coast. Medium-light ruby color, with bright aromas of plum and raspberry, with undertones of earth and sweet oak. Lighter-bodied, this had very lively acidity in the mouth and a clean finish. Hirsch 2009 Pinot Noir, “San Andreas,” Sonoma Coast. To be released later this year. Medium color, displaying more intense aromatics and deeper fruit than the “Bohan Dillon” bottling, along with a more noticeable spice component. More structured, with chewy tannins on the finish. Hitching Post 2008 Pinot Noir, “Hometown,” Santa Barbara County. Lighter color, this was fruit-forward, with black cherry aromas along with herb and tea leaf notes. Medium-light bodied with a smooth, clean finish. Not complex but tasty. Hitching Post 2007 Pinot Noir, “Highliner,” Santa Barbara County. Medium color, with brighter black cherry fruit, herbs, earth, and oak on the nose. Fairly rich texture with refined tannins and a smooth finish. Hitching Post 2007 Pinot Noir, “Perfect Set,” Sta. Rita Hills. Barrel selection, sourced from Fiddlestix vineyard and aged in 100% new French oak. Medium ruby color, showing lots of upfront ripe plum and darker fruit, vanilla/oak, earth, and baking spices. Rich and mouthfilling, with a big hedonistic finish. Holdredge 2009 Pinot Noir, Bucher Vineyard, Russian River Valley. Medium-light color, with spicy red fruits and a touch of sweet oak. Great acidity in the mouth and a clean, lively finish. Holdredge 2009 Pinot Noir, “Selection Massale,” Russian River Valley. Medium-light color, the aromatics were a bit shy at first, but revealed black cherry, plum, lots of spice, and earth on the nose. Also somewhat tight on the palate, with a structure that suggests a few years of cellar time will round out this wine nicely. Holdredge 2009 Pinot Noir, “Shaken Not Stirred,” Russian River Valley. From 37 year-old Martini clone vines. Medium-light color, displaying aromas of bright red fruits, tea leaf, a touch of earth, and a savory note. Medium-bodied with a vibrant mouthfeel with a clean, mildly tannic finish, quite nice. Holdredge 2009 Pinot Noir, “Mazie Rose,” Russian River Valley. Medium color, this showed raspberry and plum fruit along with spice and a bit of oak. Richer than the first three wines, this still had good acidity along with moderate tannins. Holdredge 2009 Pinot Noir, “Rolling Thunder,” Russian River Valley. Medium color, with more noticeable spicy oak on the nose, plus a darker fruit profile and a bit of cola. The boldest of the five wines, this had a bigger structure and more weight on the palate, with a grippier finish. Comments: A solid line-up of wines, with the “Shaken Not Stirred” bottling being my favorite of the bunch. The Martini clone of Pinot doesn’t get a lot of respect these days but fruit from older Martini vines can produce some very fine wines. Inman 2010 “Endless Crush” Rosé of Pinot Noir, “OGV,” Russian River Valley. Very light salmon color, fresh pure strawberry aromas, along with touches of mineral and orangepeel. Bright and lively on the palate, with just a hint of tannin on the clean, tasty finish, nice. Inman 2008 Pinot Noir, Russian River Valley. Medium-light color, fruit-forward nose of red fruits, smoke, and spice. Medium-light bodied with a mild tannic grip on the finish. Inman 2008 Pinot Noir, “OGV,” Russian River Valley.Slightly darker color, with raspberry, cola, and baking spice on the nose, along with a mineral note. Fairly smooth texture but with more structure than the ’08 RRV bottling, this had a tasty finish. Comments: The Inman “Endless Crush” Rosé is produced only in even-numbered years, with fruit specially picked for this bottling, then destemmed and pressed. I thought it was the best Rosé I tasted at the event. Joseph Swan 2007 Pinot Noir, Saralee’s Vineyard, Russian River Valley. Very light garnet color, featuring earthy red fruits with herbal notes. Medium-light bodied with a vibrant mouthfeel and fairly smooth and tangy finish. Joseph Swan 2009 Pinot Noir, “Cuvée de Trois,” Russian River Valley. Medium-light ruby color, with deeper raspberry and plum aromas, earth, and spice. Richer texture than the Saralee’s bottling, with mild tannins. Joseph Swan 2007 Pinot Noir, Trenton View Vineyard, Russian River Valley. Medium-light color, showing red fruits, spice, and cola on the nose. Smoother on the palate, but with moderate tannins that crept up on the finish. Joseph Swan 2008 Pinot Noir, Trenton Estate Vineyard, Russian River Valley. Medium-light color, this showed more high-toned aromas of strawberry, cherry, and earth, along with more elevated acidity in the mouth and firmer tannins. Joseph Swan 2007 Pinot Noir, Trenton Estate Vineyard, Russian River Valley. Medium ruby color, with black cherry and raspberry, dried herbs, baking spices, and a floral note. Seamless and silky on the palate, with lively acidity and refined tannins, quite nice. Comments: I’ve had some hits and misses over the years from Joseph Swan, but I thought this was a very good and nicely varied group of wines. Kanzler 2009 Pinot Noir, Sonoma Coast. About 20% whole-cluster fermentation. Medium color, showing ripe plum and darker berry fruit, spice, and undertones of vanilla/oak. Medium-full bodied with a smooth yet lively mouthfeel and fairly mild tannins on the finish. Keefer Ranch 2008 Pinot Noir, Russian River Valley. Medium-light color, with ripe raspberry, clove, earth, and an underlay of vanilla/oak. Fairly smooth on the palate, with moderate tannins on the finish. Keefer Ranch 2009 Pinot Noir, Russian River Valley. Medium-light color, this featured more intense black cherry aromas along with spice, cola, and a touch of sweet oak. A bit bigger and more structured in the mouth, with more grip on the finish than the ’08. Showing well now and should age nicely. Comments: Both wines are from the estate vineyard, and made from Swan, Pommard, and 115 clones. Kendric 2009 Pinot Noir, Marin County (barrel sample). About 50% whole-cluster fermentation. Medium-light color, this showed bright and floral red fruits and lots of spice on the nose. Lively but somewhat tight in the mouth, with some grippy, youthful tannins that will require some bottle age to round out. Needs time to develop, but shows a lot of promise. Comments: I’d tasted the ’07 and ’08 Kendric Pinots just a week earlier so I only tried the ’09 barrel sample this time. The ’08 Marin Pinot in particular was a standout in the earlier tasting. Ladd 2008 Pinot Noir, Sonoma Coast. Light color, bright black cherry, spice, and slight floral and tea leaf notes. Medium-light weight on the palate, with vibrant acidity and a clean finish, nice. Ladd 2008 Pinot Noir, Russian River Valley. Slightly darker color than the Sonoma Coast bottling, showing bright red fruits, a touch of earth, and lots of spice. Medium-bodied, smooth but lively. Ladd 2008 Pinot Noir, “Cuvée Abigail,” Sonoma Coast. Medium-light color, featuring earthy raspberry and plum aromas. A bit bigger and more structured than the first two wines. Ladd 2008 Pinot Noir, Moore Ranch, Russian River Valley. Medium-light color, with a bit darker fruit profile along with spice and a dash of oak. Richer mouthfeel and with more tannic bite on the finish, this could use some bottle age to show its best. Le Cadeau 2008 Pinot Noir, “Côte Est,” Oregon. Medium ruby color, strawberry and cherry fruit along with spice and earth notes. Medium-light weight in the mouth, with good acidity and a clean finish, nice. Le Cadeau 2009 Pinot Noir, “Rocheux,” Oregon. Medium-light color, with more forward and intense red fruit, cloves, and spicy oak. Medium-bodied and lively on the palate, with noticeable but refined tannins. Le Cadeau 2009 Pinot Noir, “Équinoxe,” Willamette Valley. Medium color, displaying black cherry and plum, earth, spice, and oak aromas. Richer and smoother mouthfeel, with a moderately tannic finish. Comments: Tom and Deb Mortimer have planted roughly 10 acres of their 28 acre parcel in the Dundee Hills. Each of their wines is made by a different winemaker. 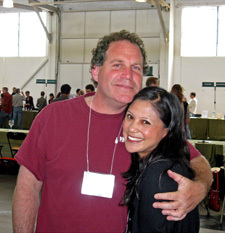 Aubichon Cellars is a partnership of the Mortimers and Jim Sanders, the winemaker of the “Équinoxe” wine. Londer 2009 Pinot Noir, Anderson Valley. Sourced from four vineyards. Medium-light ruby color, with upfront raspberry and wild berry aromas supported by lots of spice and a floral note. Lighter-bodied and lively, with a fairly smooth finish. Londer 2007 Pinot Noir, Ferrington Vineyard, Anderson Valley. Medium-light color, red fruits, herbs, and a touch of oak on the nose. Medium-bodied, with tannins that turn a little bitter on the finish. Londer 2007 Pinot Noir, “Paraboll,” Anderson Valley. From Valley Foothills and Ferrington vineyards. Medium color, with raspberry and plum fruit, baking spices, and vanilla/oak. Bigger and richer mouthfeel, with refined tannins on the smooth finish. Londer 2007 Pinot Noir, Estate, Anderson Valley. Medium color, this had a more complex nose of plum, minerals, tea leaf, spices, earth, and sweet oak. More structured on the palate, with enough grip on the finish to suggest some further aging will benefit this wine. Loring 2009 Pinot Noir, Keefer Ranch, Russian River Valley. Medium-dark color, with raspberry, cola, and spice on the nose. Medium-full bodied and somewhat tight, this could use more time or decanting to help it open up. Loring 2009 Pinot Noir, Garys’ Vineyard, Santa Lucia Highlands. Medium-dark color, with upfront plum and black cherry fruit, baking spices, and a slight orangepeel note. Also somewhat tight and moderately tannic at this point, another candidate for a bit of cellar age. Loring 2009 Pinot Noir, Cargasacchi Vineyard, Sta. Rita Hills. Medium-dark color, with a darker berry fruit profile, along with some earth and dried herb notes. Mouthfilling texture, with some tannic grip on the finish. Loring 2009 Pinot Noir, Clos Pepe Vineyard, Sta. Rita Hills. Medium-dark color, showing aromas of earthy dark berry fruit, stony minerals, and lots of spice. Structured on the palate but with more refined tannins, showing nicely now but should age well too. Loring 2008 “Divergence,” Paso Robles. 55% Cabernet Sauvignon (200% new American oak), 45% Mourvèdre (100% new French oak), sourced from Russell Family Vineyard. Very dark color, intense aromas of very ripe dark fruits, mocha, tobacco, spice, and sweet oak. Rich and dense in the mouth, with firm but not harsh tannins. Not for everyone, but quite an interesting wine. Melville 2005 Pinot Noir, Estate, Sta. Rita Hills. Medium-light garnet color, spicy and somewhat stemmy plum and darker fruits, tea leaf, and earth. Lively on the palate and not too tannic. Melville 2009 Pinot Noir, Estate, Sta. Rita Hills. About 33% whole-cluster fermentation, aged in neutral oak. Medium-light ruby color, more fruit-forward black cherry and raspberry, along with spice and an herbal/green note. Medium-full bodied, with a fairly grippy finish. Melville 2009 Pinot Noir, “Carrie’s,” Estate, Sta. Rita Hills. About 60% whole-cluster fermentation. Medium color, with raspberry and plum aromas that were less upfront than the SRH Estate bottling, plus spice, black pepper, tea leaf, and oak components. Mouthfilling and structured with tannins that were fairly big but refined, nice. Comments: Chad Melville was on hand to pour at the event. I’d tasted a number of the current Melville releases at the winery a few months prior, but wanted to revisit some, especially with the opportunity to taste the ’05 Estate alongside their new wines. Monks Gate 2008 Pinot Noir, Estate, Yamhill-Carlton District, Willamette Valley. From Pommard, 667, and 777 clones. Medium-light color, with bright cranberry and strawberry aromas, plus herb and earth notes. Lighter-bodied and lively on the palate. Monks Gate 2007 Pinot Noir, Estate, Yamhill-Carlton District, Willamette Valley. From 667 and 777 clones, about 20% new oak. Medium-light color. More earthy/mushroomy and less fruit-driven than the ’08 vintage, showing some tea leaf on the nose as well. Slightly bigger mouthfeel and more tannic than the ’08. Comments: Monk’s Gate has 19 acres planted to the 777, 667, 115, Pommard, and Wädenswil clones of Pinot Noir. Presqu’ile 2010 Rosé, Santa Maria Valley. Light salmon color, with lightly herbal watermelon aromas. Lighter-bodied and smooth. Presqu’ile 2009 Pinot Noir, Santa Maria Valley. Medium ruby color, showing red fruits, herbs, and a touch of vanilla/oak. Medium-light bodied with a fairly smooth texture and mild tannins. Comments: Presqu’ile had more wines I would have liked to taste, but their pourer was preoccupied with a couple of people at the crowded table, all but ignoring the rest of us who were waiting for a taste, and my patience only lasted so long. Oh well. Raptor Ridge 2009 Pinot Noir, Willamette Valley. Medium-light garnet color, with upfront strawberry, and bing cherry aromas, plus earth and oak notes. Fairly light on the palate, with somewhat bitter tannins that sneaked up on the finish. Raptor Ridge 2008 Pinot Noir, “Reserve.” Willamette Valley. Medium color, a bit reductive at first, more earthy black cherry and forest floor, less fruit-forward than the ’09, and showing a bit more oak. Medium-bodied and structured, with a grippy finish. Scherrer 2010 Dry Rosé, Sonoma County. Rosé from mostly Pinot Noir and Zinfandel saignée, with a little Syrah. Light pink/salmon color, aromas of watermelon and dried herbs, with a fairly smooth mouthfeel and finish. Scherrer 2007 Pinot Noir, Sonoma County. Medium-light color, showing very spicy red fruits and a touch of earth. Medium-light bodied, with a round mouthfeel and lively finish. Scherrer 2007 Pinot Noir, Russian River Valley. Medium ruby color, with more intense raspberry, cola, and spice on the nose. A bit richer on the palate, with noticeable but refined tannins. Scherrer 2007 Pinot Noir, “Big Brother,” Sonoma Coast. Sourced from the Annapolis area. Medium color, displaying bright red fruits, tea leaf, and forest floor, along with a touch of baking spice. Medium-bodied, vibrant, and elegant in the mouth, with a long, tasty finish, nice. Comments: Fred Scherrer poured an impressive line-up of wines. The “Big Brother” would have been on the “favorites” list if not for the ’08 Sonoma County bottling – both were outstanding. Sequana 2009 Pinot Noir, Santa Lucia Highlands. Sourced from Sarmento Vineyard. Medium color, bright and ripe cherry fruit along with earth and spice. Medium-bodied with moderate acidity. Sequana 2009 Pinot Noir, Russian River Valley. Sourced from three vineyards. Medium ruby color, showing ripe black cherry, cola, and spice on the nose. Round but lively mouthfeel with somewhat bitter tannins on the finish. Sequana 2009 Pinot Noir, Dutton Ranch, Green Valley of Russian River Valley. Medium color, with more intense ripe plum and darker berry fruit, cola, earth, and spicy oak. Fairly rich on the palate with a smooth finish. Comments: The Sequana wines are made by noted Pinot producer James MacPhail. Skewis 2008 Pinot Noir, Salzgeber-Chan Vineyard, Russian River Valley. Medium-light ruby color, bright aromas of strawberry and red cherry, earth, and a touch of toasty oak. Lively mouthfeel with good acidity and clean finish, nice. Skewis 2008 Pinot Noir, “North Coast Cuvée,” North Coast. Sourced from vineyards in Russian River Valley and Anderson Valley. Medium-light color, showing a bit darker fruit profile, along with a big spice/clove component. Bigger and more structured on the palate with moderately grippy tannins. Skewis 2008 Pinot Noir, Peters Vineyard, Sonoma Coast. Medium-light color, displaying riper black cherry and raspberry, baking spices, earth, and more noticeable oak. Medium-bodied with nice texture in the mouth and refined tannins on the finish. Small Vines 2009 Pinot Noir, Russian River Valley. Medium ruby color, with black cherry, rhubarb, cola, and a dash of pepper. Medium weight with fairly mild tannins. Small Vines 2009 Pinot Noir, MK Vineyard, Sonoma Coast. To be released later this year. Slightly darker color, displaying bright raspberry and plum, earth, and dried herbs along with a touch of oak. A bit bigger on the palate than the RRV bottling with good structure and a long and lively finish, nice. Small Vines 2009 Pinot Noir, Baranoff Vineyard, Russian River Valley. To be released later this year. Medium-dark color, with ripe cherry, cola, and spice aromas plus an underlay of sweet oak. Richer and smoother mouthfeel, with moderate tannins. Sokol Blosser 2008 Pinot Noir, Dundee Hills. Medium-light color, featuring bright, earthy cherry and raspberry aromas, with spice and tea leaf notes. Vibrant mouthfeel with an elegant texture and lively finish, nice. Sokol Blosser 2008 Pinot Noir, “Estate Cuvée,” Dundee Hills. Medium-light color, with more focused cherry and cranberry fruit, minerals, spice, and oak. Medium-light bodied with bright acidity and tannins that were a touch bitter on the finish. Sokol Blosser 2010 Rosé of Pinot Noir, Dundee Hills. Very light pink color, pure wild strawberry on the nose. Tingly acidity in the mouth, with a crisp, refreshing finish, nice. Comments: A strong group of wines from Sokol Blosser. Testarossa 2009 Pinot Noir, Santa Lucia Highlands. Sourced from four vineyards. Medium ruby color, ripe cherry, spice, with touches of citrus zest and sweet oak on the nose. Medium weight and round on the palate, with very mild tannins. Testarossa 2009 Pinot Noir, Santa Barbara County. Made for sales to restaurants. Medium color, with fruit-forward aromas of cherry and raspberry, plus a touch of dried herbs and a dash of oak. Medium-light bodied, fairly straightforward and smooth. Windy Oaks 2008 Pinot Noir, “Wild Yeast,” Estate, Santa Cruz Mountains. 65% new oak. Medium-light color, featuring floral red fruit aromas, black pepper, spice, with an herbal note. Very lively on the palate, with good acidity and fairly mild tannins on the long finish, nice. Windy Oaks 2008 Pinot Noir, “100% Whole Cluster,” Estate, Santa Cruz Mountains. 40% new oak. Medium-light color, showing lots of spicy cherry and strawberry fruit and sweet oak on the nose. Bigger and more structured than the “Wild Yeast” bottling, with more grippy tannins. Comments: Windy Oaks was one of the few Santa Cruz Mountains producers at the event. Their wines were all quite good, and very different from one another.